There is a DUI checkpoint planned in Cincinnati Friday night, May 12. In Ohio, checkpoints are determined by police where they will set up traffic cones and barricades to stop vehicles and check for suspected drunk drivers. These checkpoints must adhere to many guidelines. For instance, police will check every other vehicle, or every third vehicle, etc. The driver stopped will be checked by the officer for signs of drug or alcohol impairment and intoxication. They will be looking for slurred speech, a smell of alcohol and they must have a reason to believe the driver who is stopped at the checkpoint has been drinking before they can conduct a breath test. There are requirements police officers and those administering the checkpoints must follow, such as establishing the pattern in which to stop vehicles. The checkpoints also must be publicized before they are held. This means the notices often are printed in local newspapers and announced on local radio stations nearly a week in advance. The advanced planning of sobriety checkpoints is crucial to ensuring they are legally done. Failure to do so could be used as evidence that the checkpoint techniques were not legal, thus the stop and all of the evidence was not legitimate. 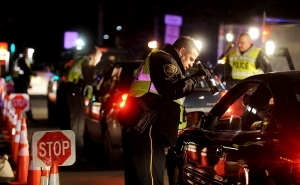 This is one way in which DUI charges can be reduced or dropped after a DUI checkpoint stop. A good criminal defense attorney can examine your case to discover if this applies to you. When approaching a checkpoint, drivers should roll down their car window to speak to the officers. From there, they likely will ask questions about where you have been, where you are going and if you have consumed alcohol or drugs. You have the right to remain silent. If there is no suspicion of the driver being under the influence, the stop likely will last about 20 seconds. When drivers are stopped at DUI checkpoints, it is important to be cooperative, disagreeing with law enforcement will not make the situation easier. If a driver is suspected to be intoxicated, he or she will be asked to pull over out of the way of traffic. Law enforcement officers then could ask the driver to submit to a chemical test of his or her blood, urine or breath. The officer also could have the driver complete field sobriety exercises. All of which you have the right to refuse, and the right to call a criminal defense attorney on the spot. It is important to remember that any questions asked by officers that do not relate to your identification, insurance, or vehicle registration are not required. Officers cannot arrest you for refusing to answer their questions about where you were going, or refusing to blow into a Portable Breathalyzer Test machine. Additionally, that information cannot be used against you in court to show your guilt.